Let’s accept it. We are in a gig economy and everyone wants to find out how to make extra money. Every other person is doing a side job/side hustle along with their main job. I am sure many of you know and agree that having a single income is not enough these days. 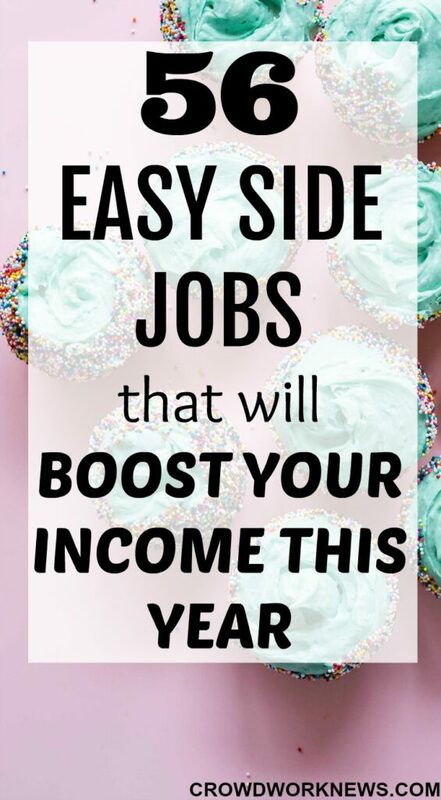 Side jobs or side hustles are like your income boosters which can improve your financial situation. Having multiple income streams is something everyone is turning to and it has become very easy to start a side job and make extra money. Even the highest paid workers need side gigs for a lot of reasons. Today, I am sharing a long list of side gigs that you can do while doing your main job. Most of these gigs are flexible which can complement your day job. Well, this could be the simplest way to earn some side cash just by using your laptop. You can use apps like Nielsen Compute & Mobile which pay around $50 per year just to keep them on your computer. Your data is totally secure and the is the most passive way to earn extra money. Ok, this might be the most convenient thing for you if you want to juggle side gig along with our job. There are many ways you can earn additional income like watching videos on Swagbucks TV, Perk TV, Viggle, AppTrailers, etc. This could be an enjoyable and refreshing way to make money on the side. Ok, I know most of us shop online. What if there was a way to make money while you spend it? Cool, right?! Cashback websites precisely do that. Just sign up for legitimate cashback websites like Ebates, TopCashback, ShopTracker, etc. You will be surprised at how much you can earn back for your usual shopping. This could be a cool side money gig giving you cash most passively. You can also use apps like Drop which will give you money when the price drops. Is one of your new year goals to lose weight? One of the most popular new year resolutions is to stay fit and lose weight. If that is what you are aiming for, then you will make money while doing that. With HealthyWage, you can earn money while you crush your weight loss goals. Some even have reported winning $10,000 on this website. Get in shape and earn money! I can give you first-hand information about being a Search Engine Evaluator because that’s what I do. It is the most flexible and non-technical job you can do in your extra time. Though the term is very techie, the role does not entail any technical experience. If this is what you want, then apply to companies like Appen Butler Hill, Lionbridge, and ZeroChaos. I am sure you must have spent a fortune on your phone. Many of us do but imagine if you could earn at least some of it back. You can do many things to earn extra income from your phone like taking photos of job signs, play games, scan receipts and many more things. I know it is surprising to hear that you can earn extra money just by listening to music. Sure, you can! There are many ways you can do this. Join companies like Slice the Pie, FusionCash, Music Xray and start earning extra cash while enjoying the music. Though this is just an extra income option, listening to music is something many of us do, so why not earn money from it. Good news is that FusionCash gives you FREE $5 to join. Are you a shutterbug like me? I can surely say I am a lifelong learner when it comes to photography. But apart from being a fantastic hobby, you can monetize this passion. You can sell your photos online in places like Shutterstock, Fotolia, Bigstock, etc. You can learn more advanced skills from courses and sell digital prints as well. Have you heard of Amazon’s MTurk? If not, then it is a crowdsourced platform to earn some extra cash in your spare time. MTurk has multiple tasks like data annotation, typing, transcription, short writing gigs and many more. What makes it a great side gig is that you don’t need to have any particular expertise to start earning on this platform. Go ahead and read more about how to join Mechanical Turk here. You must have heard about flipping in general but do you know about flipping websites. Website flipping is buying sites for low price and selling them for profit. If you have the technical expertise, you can create a website from scratch and sell it for profit. You can earn around $1000 a month flipping sites. The basic idea is to revamp the website and sell it. My friend Jenn has been flipping sites for over two years, and she teaches others to do the same. This area has a very high-income potential and is flexible. If you love to write, then you can turn it into a profitable side hustle while keeping your job. There are many ways you cn use your writing skills like freelance writing, starting a blog, or ghostwriting. If writing is your thing, then I would highly suggest blogging. I earn almost a full-time income blogging part-time. Though it needs a lot of work ahead and learning, you can turn your writing into a full-blown business with blogging. Online teaching has become most popular in the last decade for making money online. Why most of the full-time workers opt for teaching online is because it is very flexible. You can set your hours and teach even conversational English. If you want to give this a go, then join companies like TutorMe, TutorVista, VIPKID, etc. You can earn anywhere between $16-$22 with VIPKID. Testing websites role is entirely non-technical, and you can do this from anywhere. This super flexible side job requires you to have some basic understanding of sites. The companies like TrymyUI, Whatusersdo, Erlibird has positions open for website testers from time to time. Customer service is one of the most wanted work-at-home jobs and side gigs among others. Why is that? Because most of the customer service companies have flexible shifts, and you can even work during nights. If you are looking for something like this, then apply for Amazon, Apple, Hilton Hotels, The Chat Shop, etc. This might be a job as such but investing your money can get multiplied if you make the right choices. Acorns application is one such app that helps you to invest your spare change, which in turn can grow passively. Acorns will not make you a rich person, but it is a smart way to getting started in investing. Do you get a lot of compliments on your voice? Then try being a voice-over actor or an audiobook reader. This is a very flexible side job for someone who wants to juggle their jobs with a side hustle. You can try to apply for voice over acting gigs for websites like VoiceBunny, Voices.com, etc. This is a perfect side hustle which involves moderating forums, social media groups, chat rooms and more. You can apply to Metaverse Modsquad, CrispThinking, LiveWorld and ICUC for moderation jobs. Interested in earning some passive income? Check out Paribus. Paribus checks the price drop on the things you have purchased, and you can get the price difference automatically. It is a great way to make some passive income without having to spend time on it. As a travel planner, you carefully plan travel plans for others. This is quite an exciting job if you love to travel. This role does not require any expertise or prior experience in any field. You can always set your rates depending on the planning you do. With Pleio, you work with patients reminding them to take their medication and get them on schedule. You will be working as a ‘Goodstarter,’ and the timings are quite flexible with this job. So, if you like this side gig, then apply for this role. You can always juggle your full-time job with having an e-commerce store. If you want to have a very flexible and an excellent passive income option, then you need to have an online e-commerce store. Jenn makes over $15,000 a month from her e-commerce store only working part-time. If you are a social media junkie and can’t keep off it, then you can make money from it by becoming a brand ambassador. Just sign up with Izea, and you can start making money from your following. If you love Instagram more specifically, then take Emma Lomas’s fantastic course. She makes a significant income from Instagram and teaches how to do it. Are you good at typing? Then you should look at companies like DionData, The Smart Crowd, Clickworker. These are legitimate work-at-home companies that have data entry gigs open for work-at-home enthusiasts. Product testing is another interesting extra cash opportunity which does not take much of your time. In fact, you get to test all the good stuff and also get paid for it. There are some excellent product testing companies like Influenster, BzzAgent, SheSpeaks, etc. This could be a side income opportunity. Did you know that editing/proofreading make up for a very convenient side hustle? If you have the flair of sifting through the documents for errors, then you can start doing editing/proofreading for companies like ProofreadingPal, Proofreadingservices.com, etc. You can also take this free course to find out more about this side hustle. If you are someone who creates new dishes every time and is very keen on finding new recipes, then you can look at a couple of options to make money from this. You can start a food blog and make money from blogging or simply sell your recipes online to magazines. If you have a lot of electronic junk like an old phone, CDs, video cameras or even books, then you can turn that junk into cash with Decluttr. This company makes it super easy to sell your old electronic stuff, and you can do all your selling conveniently from the app. You must know by now that Amazon is the biggest marketplace around, but did you know that you can sell on this platform and earn more than a full-time income. It is true. If you wanted to get started with AmazonFBA as a side hustle, then take this free course. Jessica made over $100,000 from Amazon in her first year. Time to start hustling! These days 90% of the population is on social media. While it is great to connect people, it would be great if there was a way to monetize it. Now, there is. You have many ways to make money from social media like becoming a social media consultant or be an affiliate marketer. You can use your expert skills in answering questions on Wonder.com. You sign up, go through a simple test and start answering questions about different topics. The best part is you can do this side job without any experience. You can make extra money just by reviewing calls with Humanatic. What you need to do is listen to the calls and tag them into categories. This is great for someone who is looking for some extra cash options. You might not earn much but it surely puts some extra dollars in your pocket. Shutterstock has positions open for image reviewer from time to time. This job is part-time and requires some prior photography/editing experience. If you have the necessary editing or photography skills, then take up this hustle. Have you heard of Stitch Fix? They are styling company who hire work-at-home stylists to match clothes for the consumers. As a stylist, you will be required to have good knowledge in fashion and have a flexible schedule. The pay is around $15 per hour. This could be a perfect job for you if you have a good sense of fashion. Do you love Pinterest? I do. Many of us spend a LOT of time on Pinterest and to be able to make money from this social media platform would be awesome, right?!. You can do that by being a Pinterest VA. This is an excellent side job if you know how Pinterest works and can manage accounts for clients. If you are interested in this hustle, you need to check out ‘Become a Pinterest VA‘ course. This course has launched careers for many Pinterest VA’s. Transcription is one such hustle which is pretty much suitable for anyone. If you know typing and have the interest to take it to the next level, you should go for Transcription. You can earn a good income with this side job. If you are entirely new to this, then try out this FREE course to learn more about this fantastic online job. If you have a car that is in good condition, then there are a couple of ways you can make money from it. One of the most passive ways is renting your car. Imagine you work from home, and don’t use your car for your commute. That is the best scenario to make money from your vehicle. Use companies like GetAround.com to rent your car and earn good side income. Do you love planning events or parties? Then this could be your ideal side job. Party planning or event planning has enormous income potential, and the most significant advantage is that you don’t need any expertise to start this hustle. If you are ready to get into this side career, then check out this comprehensive course which will turn you into a fantastic event planner in no time. You can earn up to $22 per hour with event planning. Are you a budding Jamie Oliver? Then test your chef skills by hosting dinners and make money from it. Sounds interesting? Just sign up for websites like Vizeat and EatWith. After joining these companies, you share the dates when plan to have dinners along with the menu and invite people. This could be a great way to test your cooking skills before taking them to the next level. If you are a stay-at-home mom, then this could be a perfect way to make some extra cash. How much you can earn entirely depends on you and the type of meals served. On an average, you can make up to $60 per person. Ride-sharing is seriously one of the best ways to earn extra money while still having the option of working a full-time job. The two things that make ride-sharing most lucrative gig are flexibility and the earning potential. You can sign up to drive with companies like Uber and Lyft to start earning from your car. If you have some extra time to hustle, then focus groups can be your answer. Focus groups are one step above to survey panels. They have very selected participants and the time you invest in these groups is more than surveys. But the best part is the pay. Some of the legitimate focus groups like Mindswarms pay $50 per study. You can also join other legitimate focus group companies like Inspired Opinions, Nichols Research, Brand Institute, etc. If you are a craftsy kind of person and want to pursue that, then start selling your crafts/arts on marketplaces like Etsy, eBay, Zibbet, ArtFire. Selling artwork is rapidly growing, and you can cash in on this fantastic side hustle. This is not a job but surely does earn extra cash if you don’t mind running errands. People need help with a lot of things, and that is where you come in. You can sign up for websites like TaskRabbit, Gig Walk and start doing short tasks for people. These short tasks could be anything like delivering some stuff, buying things, etc. We all have old, used garments lying in our homes. Instead of throwing them away, you can earn extra cash by selling them on websites like Poshmark and OfferUp. Both of these sites make it very convenient to sell your stuff online. If you are a marketing superstar, then direct sales could be your forte. Though it might seem that MLM is all scammy, there are many legitimate direct sales companies like Avon, Stella & Dot, Chloe + Isabel, etc. Direct sales can be a great way to earn money while you hustle with a full-time job. Did you know that you can earn money delivering stuff without having to change your travel plans? Roadie makes it possible! Delivering stuff is one of those flexible gigs which can give quick cash when you travel. It could be as simple as traveling back home from work. According to the website, you can earn anywhere from $8-$50 for local gigs and around $650 for long distance gigs. By now you must have used UberEats to get your food delivered. I have used it, and it was an excellent service. But the money-making side of it is incredible. If you have some spare time on your hand, then you can become a delivery driver for companies like Postmates, DoorDash or EatStreet and start earning $10-$20 per hour based on the company you choose. If you love traveling and know your city well, then becoming a tour guide is a perfect side gig for you. Tour guiding is a fast growing side hustle for millennials, and it pays great. You can set your rates or go with the company rates. Tour guide companies like Vayable and ToursByLocals hire tour guides. Sounds fun?! Love grocery shopping? If you do, then this could turn out to be a good side hustle for them. Shipt is a company that pays shoppers to do grocery shopping for others. This could be a fun gig if you love the shopping trips and the biggest motivator is the pay. Shipt pays $15-$25 per hour, Isn’t that awesome? You can earn extra money just by checking things for others. WeGoLook is one such company that hires ‘Lookers’ to do various tasks like having a look at a car for a potential buyer or checking some records etc. A single gig can pay you $20, and you might make more for longer gigs. This is undoubtedly something to look into if you want some extra cash. If you love shopping, then mystery shopping could be your answer to make extra money. Many legitimate companies have mystery shopping gigs, like BestMark, Market Force, and Perception Strategies. How much you get paid is dependent on the company you join. If you are looking for a more flexible side job, then go ahead and sign up for Sittercity for having a gala time with kids. Babysitting is a very natural side job for stay-at-home moms, and you can choose many options like part-time, full-time or occasional care. If you have a flair for designing your own stuff or have the creative streak in you, try designing T-shirts with Teespring, Zazzle or Cafepress. You have the freedom to price your own products with some of these companies. All that it requires is some creativity and your marketing skills. So you thought your organizational skills are worth nothing? Think again. You can be an organizing superstar and make money on the side. My friend Lisa Woodruff is a pro professional organizer, and she teaches others about organizing. If you want to monetize your organizational skills, then check out her books. This is an untapped business which is slowly gaining popularity. You can start your own subscription box business in any area like organic food, vegetable, fashion, printables, kids crafts, etc. This side business could supplement your primary income and maybe even grow into a full-time business. Companies like Cratejoy make it easy for anyone to start this unique business from home. Are you fond of pets? Then why not turn this into a part-time job? It is most significant now to get paid to take care of pets from companies like Rover.com. This is a very flexible part-time job and can be done according to your schedule. Finding a side job is not hard if you know what you want to do. Whether it is an online gig or an offline job, choose the option that suits you best and complements your day job or your lifestyle. Go through these opportunities and find the one that you like and start earning. Do you know any more side gigs? Please share in comments.